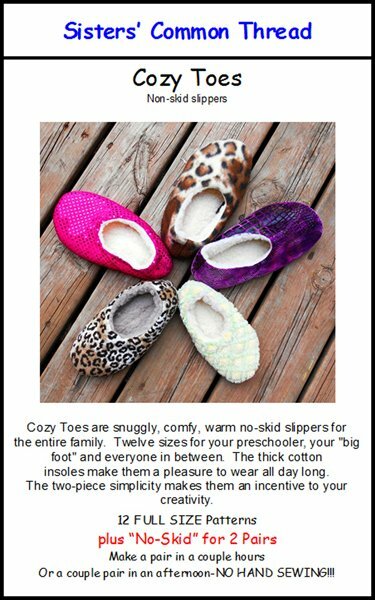 Cozy Toes Pattern Plus - Cozy Toes pattern is a palette for your creativity. Show your team colors, applique the tops, make them out of liquid sequins or fabric to match your favorite robe - the possibilities are endless. This pattern comes with non-skid for the bottoms and full size pattern pieces. The 12 sizes included will fit your family from the preschooler to the "big foot" and everyone in between. These slippers are constructed using only two pattern pieces keeping them uncomplicated yet elegant.